My mom is hosting a baby shower on Sunday (and a bridal shower tomorrow–two different women and tons of baking for us!) and these cookies are the soon-to-be mom’s favorite. She first told me about them months ago, saying she ate them all the time while living in Virginia but hasn’t seen them out here in California. Thanks to Google, I found a recipe based on the bakery’s secret cookie. These are so good–easy to make, sweet and salty, and crispy on the outside and chewy (thanks to the brown sugar) on the inside. A near perfect cookie. Why just near perfect? Because if I were baking these for myself, you better believe I’d add chocolate chips. In the large bowl of a stand mixer fitted with the paddle attachment, beat the butter for a few minutes on medium-high speed until light and fluffy. Scrape down the sides of the bowl and add the sugars, baking powder, baking soda and cinnamon, beating until the mixture is well blended. Reduce the speed to medium and add the eggs and vanilla extract, mixing until well incorporated. Reduce the speed to low and add the flour and oats, scraping down the sides of the bowl as necessary and mixing just until they are incorporated. Cover the bowl with plastic wrap and chill the dough for at least an hour before baking. Preheat the oven to 375 degrees. Line a large baking sheet with parchment paper. Form the dough into golf ball-size balls and place about 2 inches apart on the baking sheet. Sprinkle sea salt generously on top of each ball of dough, as you would sugar. Bake 1 sheet at a time for 15 minutes or until the cookies are puffed and beginning to turn golden, being careful not to overbake. (The cookies should have a tender interior.) Transfer the cookies, still on the parchment paper, to a wire rack to cool completely. Recipe from The Washington Post. oh my heavens. making them tomorrow!! it’s too hot to bake but if it wasn’t, i’d totally make these. sweet and salty!? heaven. The word salted always gets me when it is in a title… especially when it is something sweet. Mmmmm! Love these cookies! Looks great! sweet + salty = heaven! salty and sweet.. that sounds tantalizing to me. I’ll be book marking this! It’s 4am … and here I am craving for cookies! Your recipe sounds simple yummy! Hi there! 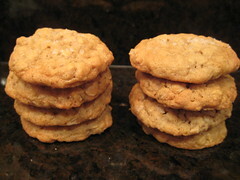 I never knew that oatmeal cookies are this easy to make. 🙂 My wife loves making them and I always thought that she had to slave away in the kitchen every time she makes a batch for us. A friend of ours recently gave us a jar of oatmeal cookies. II never really liked them before but it’s a good thing that my wife asked me to try that batch — I loved them! I’m hoping your recipe will come close to that. It looks simple enough — and that’s what I loved about those oatmeal cookies — they were simple … free from unnecessary and complicated flavors.